If you are tired of wearing out and replacing expensive heavy duty yellow air hoses, Gorilla hose could be your solution. 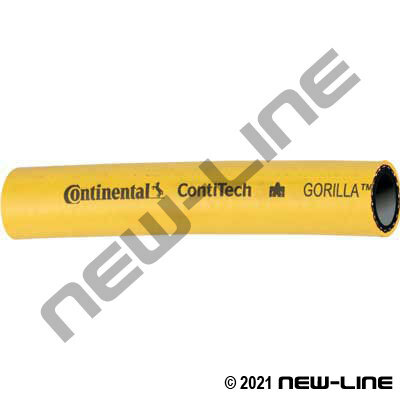 Gorilla is a premium, hi-visibility yellow multi-purpose hose used in factories, construction, agriculture, quarries, mines, railroads, oil/gas industry, and ship building. Its exceptionally tough, MSHA approved cover will resist heavy amounts of oil and abrasion, while its tube resists heat, excessive petroleum based oil as well as vegetable oil and mineral oil (typically breaks down more economical rubbers). Due to its textile reinforcement, Gorilla is 30-40% lighter in weight as compared to heavy duty, steel wire reinforced yellow air hoses. This hose will last much longer than traditional textile braided air hoses and will handle much more rugged conditions. Gorilla was designed to reduce handling costs, inventory costs, replacement costs, down time, and safety concerns. The main application is air, but could also use Gorilla as a water hose.